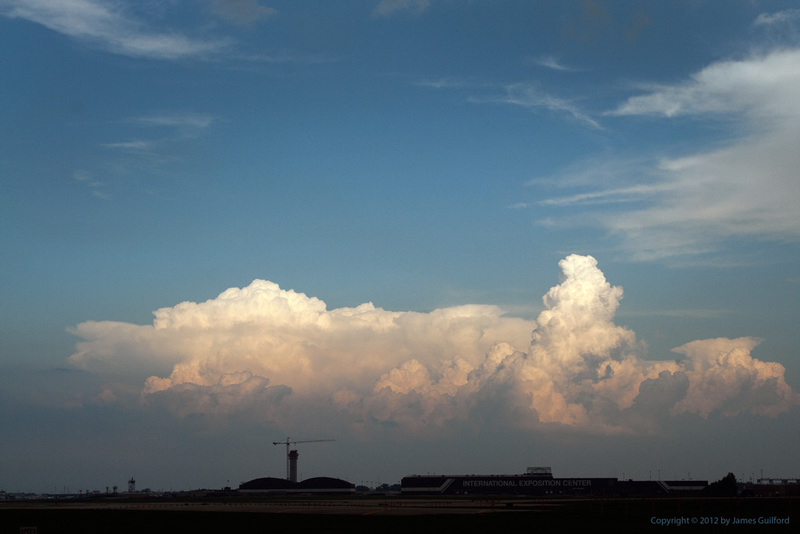 Open fields of Hopkins Airport allow a view of the expansive storm in the east. Driving home can be an adventure. Exiting the parking lot this evening I looked to the east and a huge and growing pile of clouds — a thunderstorm was brewing! So I adjusted my route to keep as much open sky around me as possible and headed out. The best vista afforded me was a grassy knoll just off the road, a short driveway for public access conveniently located nearby. The site overlooks Cleveland Hopkins International Airport so there was plenty of open space between me and the photogenic clouds. I popped from my car, hiked to the top of the mound, and made my exposures. I was aware of a second storm building and coming on from the west — behind me — but didn’t worry about it until I heard some rumbles of thunder. There I was, atop a rise and near an open area with a thunderstorm about to overtake me. Time to move! So, it was back to the car. Light rain had set in and my route now carried me into tree-lined streets and suburban settings not well-suited to sky photography. I’d planned a stop at Heinen’s Fine Foods so headed down a busy four-lane street. The storm rolled over us! 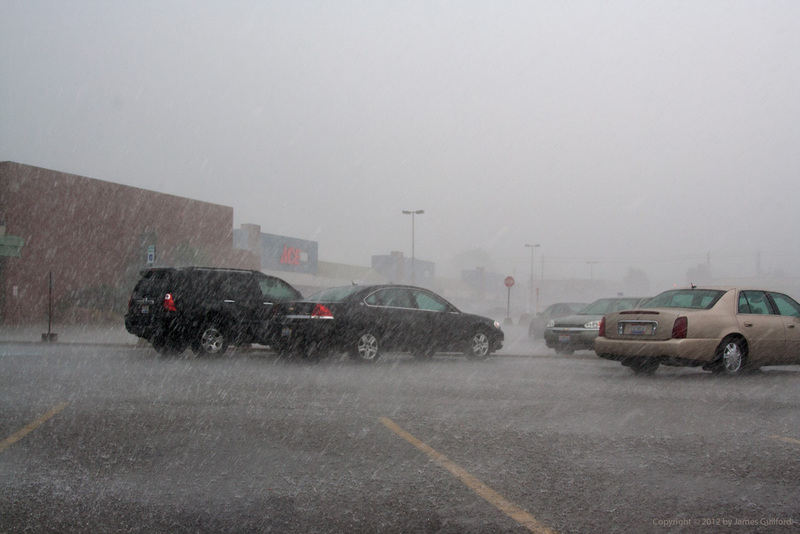 Sheets of wind-driven rain keep people in their cars. The light rain became a deluge. Winds picked up and rocked the trees. Nearby lightning with immediate thunder came like shots. What fun! Traffic was slow and visibility just good enough so I felt safe the entire time. Making it to the grocery store parking lot, I pulled into a space, rolled down a window facing away from the wind, and caught a few shots of the sheets of wind-driven rain hitting the cars and pavement. It was only a few minutes after I’d moved my car to a more suitable parking spot that the rain diminished enough for me to go inside and get some groceries. When I was done and exited the store (oh, maybe 15 minutes had passed) the rain had stopped and sun was brightly shining in a clear western sky! A slice of the monster. 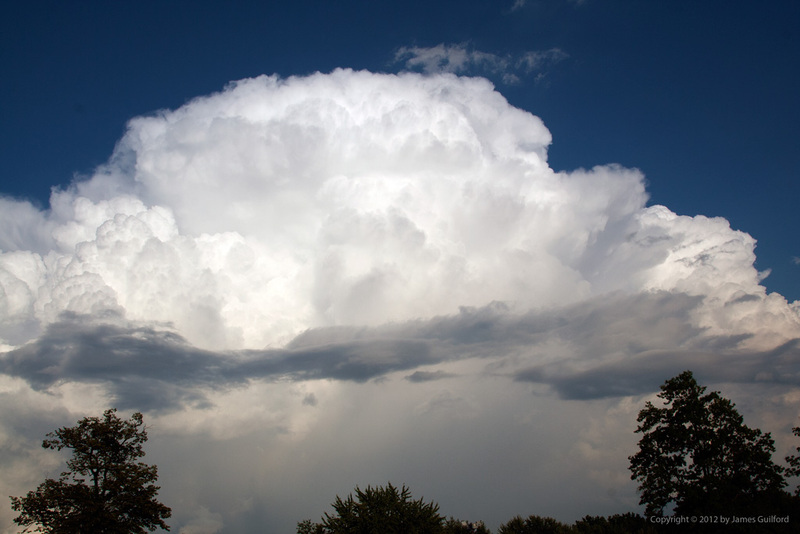 The eastern sky, however, was now filled with the towering clouds that had just unleashed such chaos. Near home I made one more weather-related photographic stop. From a parking lot overlooking church lot below I tried to take in the scope of the storm clouds now passed; it was still too close, too large to capture in one shot. So I give you this image of one slice, exposed for the clouds with the sky turning an unnatural deep blue. Yes, a simple drive home can be an adventure.